The Economic and Technological Cooperation Agreement: Full steam ahead for India and Sri Lanka? Earlier this month it was announced that India and Sri Lanka plan to sign the Economic and Technology Cooperation Agreement – which will extend and deepen the existing bilateral Free Trade Agreement – by the end of the year. Piumi Gamanayake reviews the design and success of the Free Trade Agreement to date and how the new Agreement aims to move economic relations forward. At the recently concluded World Economic Forum India Economic Summit, Sri Lankan Prime Minister Ranil Wickeramsinghe indicated that Sri Lanka and India intend to sign the Economic and Technology Cooperation Agreement (ECTA) by the end of 2016. This would be pivotal in transforming economic relations between the two countries. Economic ties between India and Sri Lanka were strong in the pre-colonial era, but these weakened during the nearly five centuries of colonial rule (Portuguese, Dutch and British). Economic relations were revived to a certain extent following independence but this was not initially significant due to the inward-looking policies that were dominant in both countries until the mid-1980s. Economic liberalisation in the 1990s injected new momentum and in 1998 the bilateral India-Sri Lanka Free Trade Agreement (ILFTA) was signed. This came into operation in March 2000. The key economic objective from Sri Lankan perspective was to increase trade ties with the dominant South Asian economic power, provide affordable Indian consumer imports to low income Sri Lankans and to steer Sri Lankan exports from low value commodities and merchandise to value added goods developed for niche markets. Prior to signing the agreement extensive research was carried out on how to devise a functional bilateral trade agreement between a small economy and an economic powerhouse, with the aim of producing favourable outcomes for both countries. The resultant ILFTA sought to account for the asymmetry between the two countries by constructing Special and Differential Treatment (SDT) provisions for Sri Lanka and successfully progressed the mobilisation of trade. Each country extended tariff concessions/preferences to all commodities except those specifically noted on a ‘negative list’ and the both sides agreed to preferential treatment on 5,112 tariff lines. Following the implementation of the FTA, trade between Sri Lanka and India surged: between 1995 and 2000 (when the agreement came into force) average annual exports from Sri Lanka to India were USD 39 million (close to 1% of Sri Lanka’s overall exports) while average imports were USD 509 million (close to 10% of Sri Lanka’s overall imports). This highlights that while India was a major source of imports it was not considered a major export market for Sri Lanka (in 2000 India was ranked as the 14th in terms of export destinations). By 2005, Sri Lanka’s exports to India reached USD 566 million, a tenfold increase compared to 2000. While in 2000, India was ranked the 14th largest destination for Sri Lankan exports, this rank spiraled to fifth in 2008 and the third largest destination after the European Union and the United States by 2012. This trend continues to date. Data released by the Central Bank of Sri Lanka in their latest annual report confirms that tremendous progress has been observed in the optimisation of the bilateral trade agreements with Sri Lanka. As a result of the continuous negotiations vested in the terms of the ILFTA, Sri Lankan exports to India stood at USD 406 million in 2015, compared to USD 354 million the previous year. By 2015, exports under the ILFTA constituted approximately 63 per cent of all Sri Lanka’s exports to India (which in turn comprised 6.1 per cent of total exports). Exports to India had also increased by 3 per cent to USD 643 million, compared to USD 625 million in 2014. This was predominantly driven by growing exports of spices, transport equipment and animal fodder. Indian exports now account for almost a quarter (23 per cent) of Sri Lankan imports. A key stimulant for the increase was reduced import taxes on motor vehicles announced in Sri Lanka’s interim budget in early 2015. This has resulted in a 565.6 per cent increase in the import of cars. In light of the ILFTA success both India and Sri Lanka were keen to augment the existing agreement to promote further economic integration by exploring new territories such as trade in services and investment. As a result of the recommendations of a Joint Study Group, a Comprehensive Economic Partnership Agreement (CEPA) was put in place in 2005. After 3 long years of negotiations the CEPA agreement was due to be signed parallel with the 15th SAARC Summit in Colombo in July. However, due to lobbying and reservations expressed by the Sri Lankan government, CEPA negotiations came to halt indefinitely in 2008 after 13 rounds of negotiations. It has been in limbo ever since. The initial draft of the ECTA, which replaces the CEPA, has been subject to negotiation for eight months. If passed, it will be a crucial reform towards an improved economic partnership with India. The draft is designed to take into consideration the drawbacks in the FTA and to establish an agreement on trade in services and technological exchange (which CEPA failed to do). The framework has been negotiated under chapters of Trade and Investment, Economic Cooperation, Trade in Goods, Trade in Services, Technological cooperation, Early Harvest for the implementation of Mutual Recognition of Conformity Assessment Procedures and a final chapter on other provisions on dispute settlement strategies, institutional arrangements, amendments and termination etc. Under the draft agreement, each country has offered list of services scheduled for trade under the proposed agreement, which has be a source controversy among detractors. Sri Lanka’s offer list is much shorter than India’s, and constitutes of computer, telecommunication, tourism, financial, health and maritime transport and auxiliary related services. India is offering an array of professional services including engineering, urban planning, health etc., computer, telecommunication, research and development, real estate, recreational, cultural, educational, environmental, tourism, construction and transport related services. As a response to the widespread speculations, fuelled by deep-rooted fear among professionals in Sri Lanka, that India will eventually saturate the Sri Lankan market with their services personnel and take over local jobs, the State Department of Commerce has made it clear that any form of trade liberalisation will be considered only after thorough consultation with the respective industry bodies. 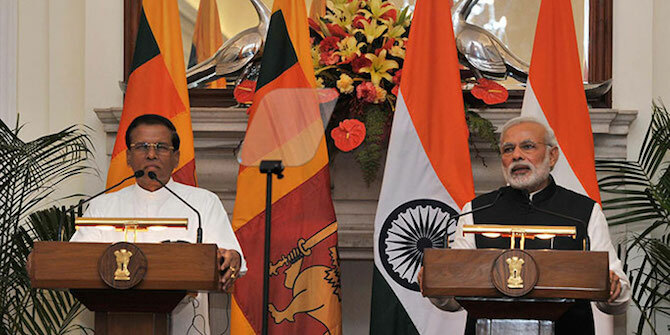 India is therefore taking a proactive approach to Sri Lanka’s post-war economic development and both sides are seeking mutually beneficial, long standing bilateral relations while also leaving space for the independent pursuit economic philosophies in line with their respective development goals. From a Sri Lankan perspective, the ETCA offers an ideal opportunity to boost private investment, and will contribute to the growth of the emerging middle class. Another aspect which should not be neglected is the fact that the ETCA is likely to strengthen Foreign Direct Investments (FDIs) by both private individuals and private institutions, which would in turn fill the presently high savings and investment gap. At a time where Sri Lanka is pressured to achieve the targets set by the IMF under the Extended Fund Facility, FDI could play a major role in helping the country reach these targets. As long as principles of non-reciprocity, special and differential treatment are sustained, the signing of the ETCA by the end of the year would therefore be of significant importance to both Sri Lanka and India. We Sri Lankan are strongly protest of proposed that ETCA agreement with Indian. Ongoing FTA between two countries of Sri-lanka and Indian must be review before ETCA sing. Govt. of India that forces us to the current Colombo puppet regime to sing ETCA without proper consultations. While Current UNP -Regime has not even taken the views of Business Communities and General Public. .
Did you seriously read the article even? If you disagree with the author on anything you only need to give an alternate reading of facts.